Watch out because this cute animal is everywhere! Deer are running free but not only because it’s Christmas, actually has this trend been out for a while? Yes! 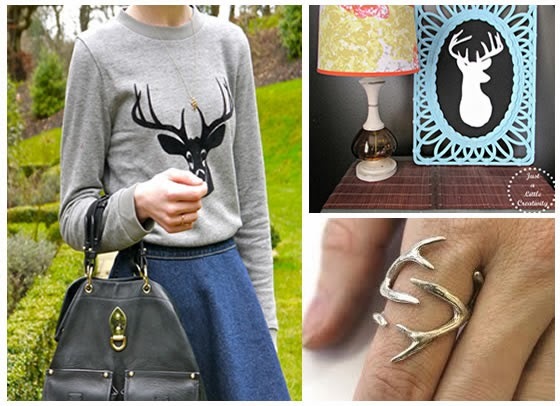 Sweaters, cardigans, jewelry and even house decoration, there are a lot of options no matter if it’s the famous sweet Bambi or just some deer antlers you decide to look for. I have to be honest, it would sound weird to me to have some deer decoration at my house, but now I think it can look cool. Check these ideas and some shopping pieces I found online. Love this selection of deer items so pretty and It such a beautiful species its not weird to have it as a décor in your home. Have a great weekend my friend. that ring is beyond belief!! LOVEIT!!! i'm quite new can u visit my blog? comment and if you like follow! I really like deer prints! awesome design!! i like the deer designs on top...its simply superb! !